Dyspepsia is a term used inconsistently across the literature to describe a wide range of upper gastrointestinal symptoms, from upper abdominal pain to heartburn, nausea, bloating, and retrosternal pain. The Maastricht V consensus guidelines recommend a policy of ‘test and treat’ for patients under the age of 45 who have dyspepsia, consisting of a noninvasive test for H. pylori infection followed by eradication if present.2 The urea breath test (UBT)—a safe means of testing for H. pylori infection—is widespread, acceptable to patients and easy to perform. Stool antigen testing with validated laboratory-based monoclonal tests are equivalent to the UBT, but may be less acceptable to some patients. Serology should not be used routinely as part of the ‘test and treat’ approach, but may be useful when patients are known to have taken antimicrobial drugs (within 4 weeks) or antisecretory drugs (within 2 weeks) before the test, or if there is ulcer bleeding, atrophy or gastric malignancies and it may not be desirable to discontinue current medications. 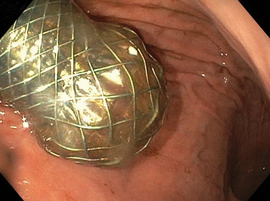 An ‘endoscope and treat’ approach is recommended for patients who are older than 45 years of age because of the higher risk of malignancy or in patients with ‘red flag’ features, such as weight loss, dysphagia, overt gastrointestinal bleeding, abdominal mass and iron-deficiency anaemia (figure 1). 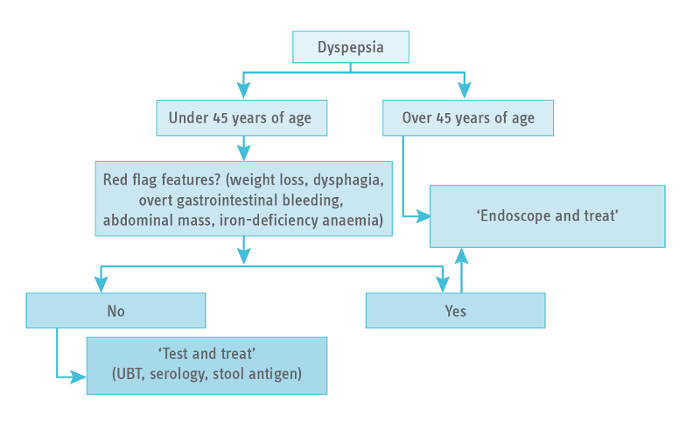 Figure 1 | The use of ‘test and treat’ versus ‘endoscope and treat’ for the management of dyspepsia. UBT, urea breath test. Courtesy of A. O’Connor. A key factor in the declining rates of success for H. pylori eradication therapies is the use of 7-day triple regimens or 10-day quadruple regimens. For all treatment regimens, 14-day courses are proven to have superior efficacy and their use has been adopted by all relevant recent consensus guidelines on the topic, including the Maastricht V guidelines, which recommend 14-day courses for all treatment regimens except when 10-day courses have been proven of equal efficacy.2 In spite of this, 7-day treatment regimes are still used in many local protocols, which is most likely a legacy issue. For standard triple therapy, meta-analyses have consistently shown that 14-day courses increase cure rates when compared with 7-day or 10-day courses and the side-effect rates did not differ.4 The OPTRICON trial of non-bismuth quadruple therapies showed 14 days of treatment achieved significantly higher eradication rates than either 7 or 10 days of treatment.5 Other large trials of bismuth-based quadruple therapies have suggested similar efficacy for 10 and 14 days of treatment, but that longer durations are superior in areas of high metronidazole resistance. However, the findings of some studies indicate that although longer durations of therapy are associated with higher eradication rates, there may also be a higher risk of events that lead to discontinuation. Gastro-oesophageal reflux disease (GORD) is increasing in prevalence worldwide, probably due to rising rates of obesity, and has known serious sequelae , such as Barrett oesophagus and adenocarcinoma of the oesophagus. H. pylori infection (especially with CagA+ strains) seems to have a negative association with GORD and its sequelae. Indeed, H. pylori infection was shown to be present in 39% of GORD sufferers compared with 50% of controls in a review of 26 studies.6 This apparently negative association has led some authorities to question whether or not H. pylori infection in a population is protective against GORD and whether falling rates of infection can explain the increase in rates of cancer arising from Barrett oesophagus in Europe. A meta-analysis on this topic has suggested that there is a statistically significant inverse relationship between serologic H. pylori positivity and Barrett oesophagus and adenocarcinoma of the oesophagus, which has led some practitioners to avoid the ‘test and treat’ strategy. However, neither of the randomized controlled trials (RCTs) of population-level screening and treat¬ment conducted in the UK demonstrated any evidence of an increase in gastro-oesophageal reflux symptoms.7,8 In addition, in the trial by Moayyedi et al., reflux symptoms were less frequent at 2 years among those assigned to eradication therapy than those who were not (22.6% versus 27.4%, P = 0.02).6 A separate meta-analysis showed no association between H. pylori eradication and development of new cases of GORD in the population of dyspeptic patients although in a subset of patients with peptic ulcer disease a twofold increased risk was noted.9 Given the current evidence, and as H. pylori infection is a Group 1 carcinogen for gastric cancer, discontinuing the practice of ‘test and treat’ because of anxiety about a putative risk of cancer associated with Barrett oesophagus cannot be justified. Population screening and mass eradication of H. pylori is a feasible, efficacious and cost-effective means of significantly reducing the incidence of gastric cancer in those at high risk. In addition, eradication probably offers other public health benefits in terms of reducing the incidence of peptic ulcer disease and the economic burden of dys¬pepsia in the community. Frontline practitioners can help in this by advocating for more attention to be paid to public health measures against H. pylori. Factors such as therapy duration, the motivation of the prescribing physician, the quality of the information provided to the patient, the efficacy of the treatment and the associated side effects all influence treatment compliance. Frequently, in the endoscopy unit patients may be provided with prescriptions having recently been sedated and not fully understand the need for eradication therapy. A frank and in-depth conversation should be had with the patient to explain the need to comply with eradication therapy, emphasising the complications that can be associated with H. pylori infection and the perils of antibiotic resistance. The current accepted model for gastric carcinogenesis is an expansion of that first published by Correa et al. in 1975.13 This model proposes that gastric cancer is the end result of a number of mutations that begin with an unknown environmental trigger in early life, now known to be infection with H. pylori, leading to a superficial gastritis, then chronic nonatrophic gastritis, followed by gastric atrophy and achlorhydria. Gastric intestinal metaplasia then ensues, assuming progressively more primitive forms before, finally, cell transformation occurs with the development of dysplasia and ultimately carcinoma. This model is supported by evidence from a study of individuals from communities with differing risks of gastric cancer—by the time individuals in the highest risk region were 25 years of age <25% had an entirely normal gastric mucosa. Gastric mucosa-associated lymphoid tissue (MALT) lymphoma is a rare type of non-Hodgkin lymphoma that accounts for 12–18% of extranodal disease and has an incidence of 1 per 100,000 population per year. Most patients who have gastric MALT lymphoma are infected with H. pylori, and frequently the disease can be cured by eradicating the bacterium. Knowledge of this association between H. pylori infection and gastric MALT lymphoma among physicians is patchy at best and has led to a failure to emphasise the importance of treatment and eradication of the pathogen. The significance of the sequelae of latent H. pylori infection is not always appreciated. The UBT is a valid and reliable test for evaluating H. pylori eradication post treatment, and testing to confirm treatment success should be performed at least 4–8 weeks after completion of H. pylori eradication therapy. This post-treatment confirmation of eradication is recommended in all sets of published guidelines on the topic. In spite of this recommendation, compliance with the need to retest to confirm eradication is poor—in one study retesting was observed in 62.9% of patients diagnosed in secondary care and in 53.1% of patients in primary care.14 With eradication rates falling across a large number of studies it is imperative that eradication is checked and second-line therapy prescribed when necessary. Gastroscopy is incomplete without biopsy samples being taken and H.pylori infection should be looked for at every endoscopy. The rapid urease test (RUT) is an inexpensive and fast method of detecting H.pylori infection (sensitivity and specificity >90%), which allows treatment to be prescribed at the point of care.16 Taking biopsy samples from the antrum and body of the stomach and placing both tissues in the same RUT kit increases the diagnostic yield.17 False-negative tests are not uncommon in the setting of PPI use, antibiotic use, bismuth use or acute gastrointestinal bleeding. In situations such as duodenal ulcer, where a high pre-test probability and index of suspicion for H. pylori infection exist, a negative RUT result should not be used to exclude H. pylori infection and alternative modalities, such as histologic evaluation of gastric tissue and culture and sensitivity testing, should be considered. van Blankenstein M, van Vuuren AJ, Looman CW, et al. The prevalence of Helicobacter pylori infection in the Netherlands. Scand J Gastroenterol 2013; 48: 794–800. Malfertheiner P, Megraud F, O'Morain CA on behalf of the European Helicobacter and Miscrobiota Study Group and Consensus panel, et al. Management of Helicobacter pylori infection—the Maastricht V/Florence consensus report. Gut 2017; 66: 6–30. Gisbert JP and Pajares JM. 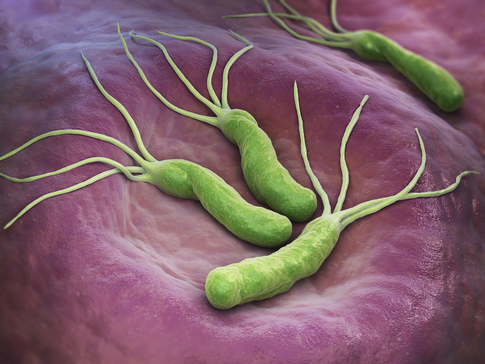 13C-urea breath test in the diagnosis of Helicobacter pylori infection—a critical review. Aliment Pharmacol Ther 2004; 20: 1001–1017. Yuan Y, Ford AC, Khan KJ, et al. Optimum duration of regimens for Helicobacter pylori eradication. Cochrane Database Syst Rev 2013; 12: CD008337. Molina-Infante J, Lucendo AJ, Angueira T, et al. Optimised empiric triple and concomitant therapy for Helicobacter pylori eradication in clinical practice: the OPTRICON study. Aliment Pharmacol Ther 2015; 41: 581–589. O’Connor HJ. Review article: Helicobacter pylori and gastro-oesophageal reflux disease—clinical implications and management. Aliment Pharmacol Ther 1999; 13: 117–127. Moayyedi P. Feltbower R, Brown J, et al. Effect of population screening and treatment for Helicobacter pylori on dyspepsia and quality of life in the community: a randomised controlled trial. Lancet 2000; 355: 1665–1669. Harvey RF, Lane JA, Murray LJ, et al. Randomised controlled trial of effects of Helicobacter pylori infection and its eradication on heartburn and gastro-oesophageal reflux: Bristol Helicobacter project. BMJ 2004; 328: 1417–1420. Yaghoobi M, Farrokhyar F, Yuan Y, et al. Is there an increased risk of GERD after Helicobacter pylori eradication? : a meta-analysis. Am J Gastroenterol 2010; 105: 1007–1013. Fitzmaurice C, Allen C, Barber R, et al. Global, regional, and national cancer incidence, mortality, years of life lost, years lived with disability, and disability-adjusted life-years for 32 cancer groups, 1990 to 2015: a systematic analysis for the global burden of disease study. JAMA Oncol 2017; 4: 524–548. Lee M, Kemp JA, Canning A, et al. A randomized controlled trial of an enhanced patient compliance program for Helicobacter pylori therapy. Arch Intern Med 159: 2312–2316. Graham D, Lew G, Malaty H, et al. Factors influencing the eradication of Helicobacter pylori with triple therapy. Gastroenterology 1992; 102: 493–496. Correa P, Haenszel W, Cuello C, et al. A model for gastric cancer epidemiology. Lancet 1975; 2: 58–60. O’Connor A, O’Moráin NR, Dobson M, et al. 182 Test, treat and retest. Who is best at checking for Helicobacter pylori eradication after a positive urea breath test (UBT), family physicians or gastroenterologists? Gastroenterology 2010; 138 (Suppl 1): S-33, DOI: 10.1016/S0016-5085(10)60153-9. Megraud F, Coenen S, Versporten A, et al. Helicobacter pylori resistance to antibiotics in Europe and its relationship to antibiotic consumption. Gut 2013; 62: 34–42. Weston AP, Campbell DR, Hassanein RS, et al. Prospective, multivariate evaluation of CLOtest performance. Am J Gastroenterol 1997; 92: 1310–1315. Moon SW, Kim TH, Kim HS, et al. United rapid urease test is superior than separate test in detecting Helicobacter pylori at the gastric antrum and body specimens. Clin Endosc 2012; 45: 392–396. © UEG 2017 O’Connor and O’Moráin. Cite this article as: O’Connor A O’Moráin C. Mistakes in the management of Helicobacter pylori infection and how to avoid them. 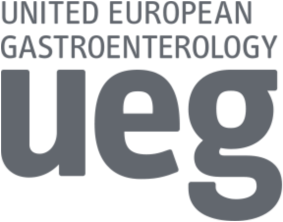 UEG Education 2017; 17: 42–44. Anthony O’Connor and Colm O’Moráin are at Tallaght Hospital/Trinity College Dublin, Belgard Road, Tallaght, Dublin, Ireland. Published online: November 30, 2017. Anthony O’Connor is a consultant gastroenterologist in Tallaght Hospital in Dublin and Honorary Senior Lecturer in Gastroenterology at the University of Dublin, Trinity College, Ireland. His research interests are H. pylori, inflammatory bowel diseases and the gastroenterological side effects of cancer therapies. Colm O’Morain is Dean and Professor Emeritus at the University of Dublin, Trinity College, Ireland, and a former UEG President. His research interests are H. pylori, inflammatory bowel diseases and gastrointestinal cancer prevention. “Is mass eradication of H. pylori rational?” session at UEG Week 2016. “From guidelines to clinical practice: H. pylori” session at UEG Week 2016. “H. pylori-associated gastric carcinogenesis” session at UEG Week 2014. “H. pylori: Have we solved all problems?” session at UEg Week 2014. “National Societies Symposia: H. pylori across Europe” at UEG Week 2014. EHMSG / ESPGHAN Postgraduate Course 2015. Fischbach W, et al. S2k-Guideline Helicobacter pylori and gastroduodenal ulcer disease. Z Gastroenterol 2017; 54: 167–206. Koletzko S, et al. Evidence-based Guidelines From ESPGHAN and NASPGHAN for Helicobacter pylori Infection in Children. J Pediatric Gastroenterol Nutr 2011; 53: 230–243.